Turning right after Wrayton, travel for around four miles on the A687 towards Burton in Lonsdale in North Yorkshire. You can’t fail to notice the motte and bailey remains on the right hand side of the road as you drive through this large Yorkshire village. The above photo shows a view of the base of the motte. This is the South West side of the castle, and it appears that this was a small, crescent moon shaped bailey area. It’s unusual double peaked summit is referred to as a breastwork structure….for obvious reasons. The castle was built on the site of a ring work enclosure, the motte and the baileys (as there are two) being placed within the original defensive site. The above photo shows the most familiar view of the castle that visitors see today. Looking South, the motte is longer than it is wide, and is instantly recognisable. The ring work site was constructed in the late 12th century, and then modified into the structure we see today in the early part of the 13th century. The huge motte, stands around ten metres tall, with the ‘breastwork’ structure adding a further three metres to its height. This castle site has two baileys attached to it. The above photo shows the interior of the Western bailey (detailed below), looking West towards Melling. The largest, which sits to the west of the motte, measures some fifty eight metres by fifty metres, and is square in shape. The second, is around 21 metres at its widest point and is a semi lunar shape, and sits to the south of the motte. A good view from outside the Western bailey area, looking East towards the motte. The break in the bank that can be seen in the foreground, could well be an original entrance into the bailey. 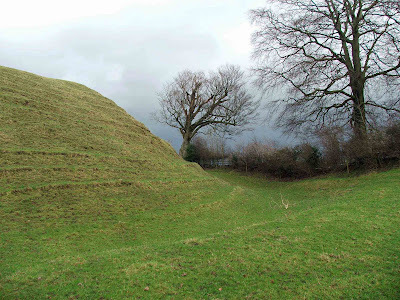 The baileys are defined by both feint and well defined earthworks, ditches and mounds. According to local records, the castle fell out of use sometime between 1322 and 1369, when it stopped being mentioned in local taxation records. 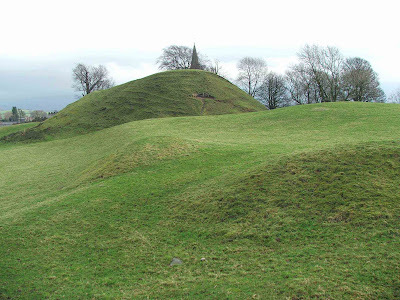 The castle and its earthworks were well excavated and investigated in 1904, and it was found that both the motte and the baileys were at some point paved. 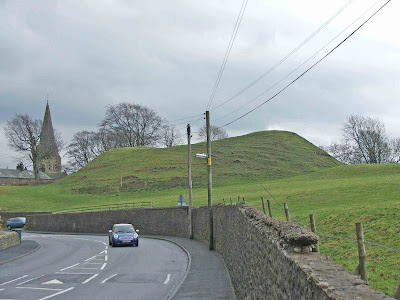 More information about this motte and bailey castle can be found later on in this blog.